The basic premise follows A New Hope by intertwining the Disney channel characters into the story. Three of the young characters are in the Empire, one is a smuggler, Agent Perry is part of the Rebellion, Phineas and Ferb play their usual selves only they are force sensitive friends of Luke Skywalker. This spread of characters allows the show to cover all aspects of A New Hope. Phineas and Ferb run into R2-D2 and the death star plans fall out of him. The two heroes then decide to embark on an adventure to get the plans back to R2-D2 and the Rebellion. In order to truly enjoy this take on Star Wars one really has to pay attention or you are going to miss little throw away lines like the quote above. I thoroughly enjoy the little nods to fandom that the writers included. One could see these as cheesy and I’d totally understand if you did but I really like those. This is a tamer version of the Family Guy Star Wars episodes but you’re watching parallel storylines to A New Hope instead of the characters being Luke, Han and Leia. It is worth the watch to see how they incorporate and explain certain things occurring. For instance, the explanation for Luke being dragged under by the dianoga creature and then suddenly released is that Dr. Doofenshmirtz (the antagonist from Phineas and Ferb) was looking for trash touched by Vader to get some dark side energy from Vader in order to make himself a better Darth. The creature dragged Luke down to Dr. Doofenshmirtz and then let Luke go when he said no. I also highly recommend it for your kiddos. My niece and nephew are going to adore this crossover! The writers include some references to the other Star Wars movies while making fun of some of the more unbelievable things that happened like Luke falling down the chute and clinging to a random antenna. They even go back to Episode I when they reference Jar Jar Binks and Ferb gets blasted by the dark side beam and turns into a Sith complete with Darth Maul-esque makeup and hair spiked into horns. I do have to say that one of my favorite odd things that happened was during a lightsaber fight between the two brothers when they took the lightsaber blade additions/modifications to a ridiculous level. I actually laughed out loud at that point. It is typical of the two to take things to the umpteenth level so I should have expected it but it is also something I thought when Maul’s lightsaber first sprouted the second blade. 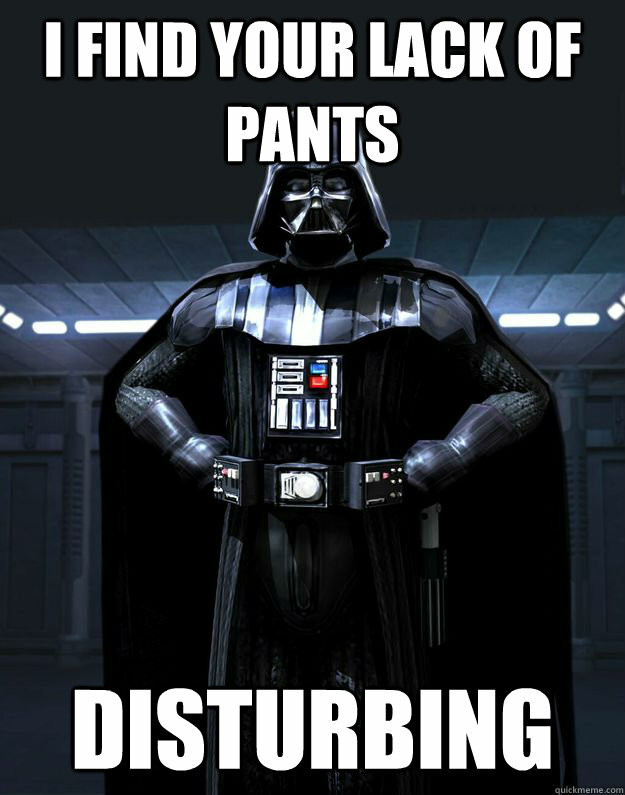 One of the side plots for the characters from the Disney show was to get Darth Vader some socks. 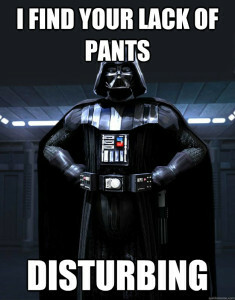 This is another fun little nod to an internet Vader meme “I find your lack of pants disturbing”. I don’t want to spoil all of the cute little nods but they happen throughout the entire movie. Towards the end they drift further from the A New Hope characters as they wrap up their own storyline. They continue to throw little blurbs in so you know where you are in the Star Wars film without just showing you an animated version. They even poked fun at the fact that by blowing up the Death Star the Rebellion was killing off supposedly innocent food workers and whatnot. However the show-stealer is none other than Jek Porkins. Such a small character in Star Wars for them to showcase in such a hilarious way but you’ll have to watch the episode to the end to see what they did! I also enjoyed the inclusion of many different species in Star Wars. One of the things that makes Star Wars so enjoyable for me has always been the different types of non-human species getting active roles so I really appreciate the writers for including one wherever possible. If you’re paying attention you’ll see quite a few familiar faces with some cute little references. Even Boba Fett makes a quick appearance in Mos Eisley! The other good thing about this is that it is available to watch for free on Watch Disney. So go ahead and enjoy a cute little take on our beloved Star Wars and let me know what you think!